Madrid-Barajas airport consists of four terminals, one satellite building and two docks, as well as another Executive terminal, and another terminal which is used for cargo handling only. 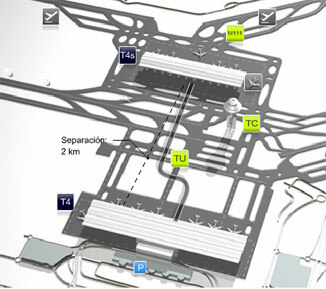 Terminals T1, T2 and T3 dispose of six boarding areas: A, B, C, D, E and F, connected to the terminals. Terminal T4 consist of two buildings, T4 and its satellite, the T4S, connected through an automatic underground train. After 72 years operating at terminals T1, T2 and T3, in at the beginning of 2006, AENA launched a new terminal, with a capacity for 70 million passengers per year. It disposes of one hundred and four direct boarding gangways. About 7.200 million euros were invested in this project. The new terminal T4 occupies currently 1.115.000 m2, distributed over two buildings - the main T4 and its satellite building T4S. These buildings, independent from each other, are connected through an automatic underground train, the APM, which operates without conductor. This stretch takes you aproximately 3 minutes. The main building serves domestic flights as well as international flights within the Schengen Area and is operated by the T4 airline companies. The satellite building T4S is reserved for all international flights outside the Schengen Area and is operated by the T4 airline companies. 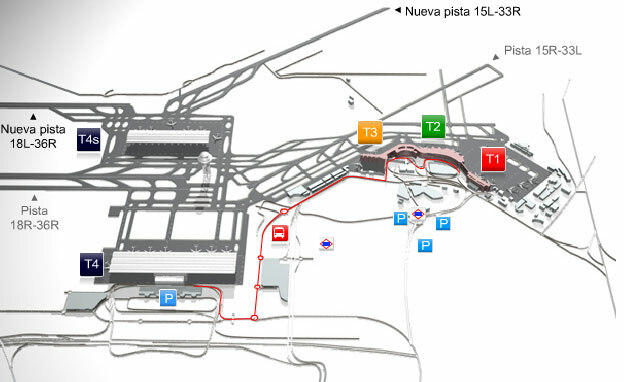 The Iberia Air-Shuttle Service flight Madrid-Barcelona (Puente Aéreo) is situated in an exclusive area of the 2nd floor of T4, at the far back on your left. You can access directly from the main entrance. This space is located at your left and it is signposted differently. In this area you can choose if you want to use the check-in counter or the automatic check-in machine. H1-H30 (floor 1, area H), J40-J59 (floor 1, area J), K69-K98 (floor 1, area E), M22-M51 (floor 0, area M), R1-R18 (floor 1, area R), S23-S48 (floor 1, area S), and U55-U74 (floor 1, area U). Here you can find the airlines and check in desk at terminal T4 and T4S, and the complementary passengers services at the airport terminals. More than 20 million Euros were invested in this new business area. The 62 shops at terminal T4 (43 shops in T4 and 19 more in T4 S) are distributed over 3.458 m2 retail space in the main building and over 4.572 m2 in the satellite building. Images property and copyright El Pais S.L. and Prisacom S.A.
Terminal Internacional flights: Operates mainly with international destinations and the following airline companies Air Europa, Air France, Easyjet, Lufthansa and about thirty more airlines. South Dock (Dique Sur): It is an annex of T1 terminal, which is completely integrated. A1-A2, A9-A12 (floor 0 area A), A2-A8 (floor 1 area A), A2-A8, A13-A14 (floor 1 area A), B18-B33 (floor 1 area A), and C30-C42 (floor 1 area C). Here you can find the airlines and check in desk at terminal T1, and the complementary passengers services at the airport terminals. Terminal for Domestic and Intra-Schengen flights:: It is the oldest operating building at the airport. It mainly serves domestic destinations and countries within Schengen territory. Here you can find the airlines and check in desk at terminal T2, and the complementary passengers services at the airport terminals. Terminal for Domestic and Regional flights. North Dock (Dique Norte): T3 is a building integrated in the North Dock, but actually is nothing more than a separated check-in area (currently not operating), as, in fact, the boarding areas and the baggage claim areas are already included in T2. The North Dock was originally planned as an extension of the domestic flights terminal, adding eleven check-in counters, five baggage conveyor belts and 20 boarding gates. Here you can find the airlines and check in desk at terminal T3, and the complementary passengers services at the airport terminals. More information about prior to departure and passenger rights at aeropuertosenred.com sections.